2 Bedroom 2 Bath With Off Street Parking 1 Block From Canal St. Street Car Line! ELEGANT!! 1300 sq. ft. Luxurious kitchen with stainless steel appliances, granite counters and decorative backsplash. 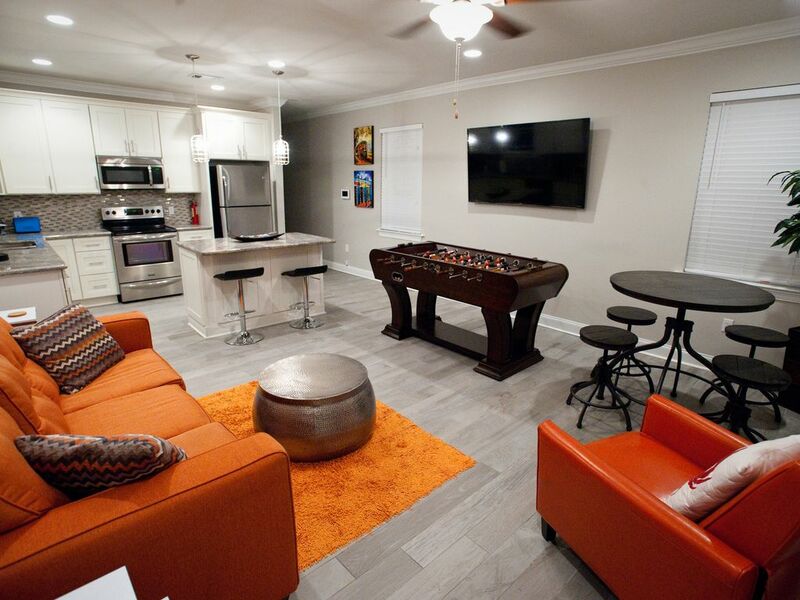 Nice spacious living room with 70 inch flat screen and surround sound entertainment system! 2 bedroom with 2 king size beds, 1 queen size sofa sleeper, 1 queen size air mattress. Each bedroom has 40 inch flat screen for your pleasure. Off-street parking! GREAT LOCATION!!! NEW ORLEANS NATIVES!! WE LOVE US SOME NOLA!! NEW CONSTRUCTION/ NEW LOCATION- 1 BLOCK FROM STREETCAR LINE!! FREE OFF STREET PARKING!! 5-10 MIN FROM FRENCH QUARTER AND ALL OTHER DOWNTOWN ATTRACTIONS!! SUPER CONVENIENT LOCATION!!! Easy on/off freeway access. toilet, shower, MASTER BATH HAS PRIVATE BATH W/GLASS SHOWER AND GARDEN TUB! toilet, tub, shower, GUEST BATH HAS DOUBLE RAINFALL SHOWER FOR 2!!!! 3 minutes from French Quarter, Convention Center, Superdome, Medical Center, 10 minutes to City Park/Museum. 15 min from Zoo!! This house is in the perfect location. There was four of us and there was more than enough room for us. The street car is one block away and we took it the first night, maybe 10 min to Bourbon St. The next 2 days we walked everywhere and it was maybe a 30 min walk to Bourbon St. We took an Uber back to the house for less than $10. So like I said it is a perfect location for everything. It’s on a nice quiet street so when u get back and want to rest u can. Everything you need is there. Just bring clothes and maybe food and your set. Preston provided everything we needed the morning we arrived and we had no problems following his directions. All in all this was the perfect house for our trip and I will stay here again. When we go back. Preston was super responsive and addressed any needs immediately. The home was clean and nicely updated. Great location not far from everything New Orleans! We'd definitely stay there again. My wife and I recently stayed here for two days with another couple. The residence was just as pictured and absolutely beautiful. Beds were very comfortable. Off street parking was great. The property manager was able to secure an early check-in for us, and was just a text away. So convenient being able to walk to the trolley. And an Uber/Lyft to the French Quarter is only a 10-15 ride away. Residence is very safe, very clean. Master bedroom is huge. Really enjoyed just sitting out on the front porch. Neighbors were very nice. I would stay here again in a minute. This was my first VRBO experience and it could not have been better. This will be my go to place anytime I’m in NOLA. We loved the place and our stay was wonderful and cery convenient. We were so close to everything as well. The host also accomodated us without hesitation when asked. Perfect location with everything we needed! The private driveway was especially helpful with street parking being a first come first in situation. Everything brand new and we will certainly be repeat customers! Great place to stay while in NOLA. Was close to street car or easy to get an uber into town to explore. Very clean and comfy beds too. We didnt have time to try it but an uber driver said it was close to a great breakfast spot. You can eat close by like a local or head over to Canal Street or the French Quarter for more shops and dining options. NEW LOCATION/ NEW CONSTRUCTION as of June 2017. 1 BLOCK FROM STREETCAR LINE!! LOCATED 3 min from French Quarter & SUPERDOME. 5 minutes to CASINO, CONVENTION CENTER AND RIVERFRONT! 5 min from World Famous New Orleans French Quarter!